Mary's Crafting Corner: Will You Be My Valentine? I made this valentine using Bubble Fun from Wags N Whiskers. I colored the image using crayola and prisma colored pencils and backed it in red cardstock. I embossed the background using a cuttle bug embossing folder (dots). I added a red sheer ribbon behind the image. Then I added 3 red gemstones to the top left corner and a red gemstone heart to the bottom right corner. Crafting With Deedee's Digis: Got Heart? What a sweet image! SO glad you played along at Wee Memories this week! Awwww cute :) Thanks for playing along w/ Oh, ALice! What an adorable card, your image is just sooooooo CUTE! LOVE your design and your bling heart, just lovely! Adorable card Mary, that image is so sweet and your card design is so neat. Love the bling, it adds the perfect finishing touch. Thanks for playing along with the AnnaBelle Stamps challenge! Hi Mary! Cute little image and i love the heart bling! Perfect for our AnnaBelle Stamps Red and White Challenge....Thanks for playing along this week and good luck! Very cute! Thanks for joining us at Oh, Alice. Really nice card! Thanks for joining us at Challenge up your life! Great layout and simply GORGEOUS card!! Thanks for playing along with PIO this week! We hope you will be back next week! Oh your image is just adorable! 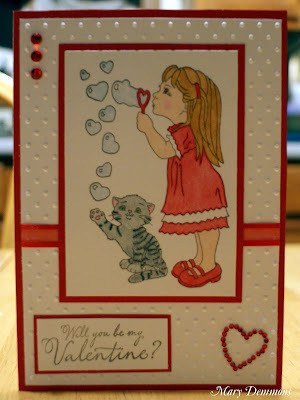 I love the embossing, the cute sentiment and those gorgeous red gems (especially the heart)! Thanks for joining the Creatalicious Valtines Ribbon Challenge. Cute! Love the heart bubbles! Thanks for playing with Some Odd Girl! Super sweet! Thanks so much for playing with Some Odd Girl's embossing Challenge! !